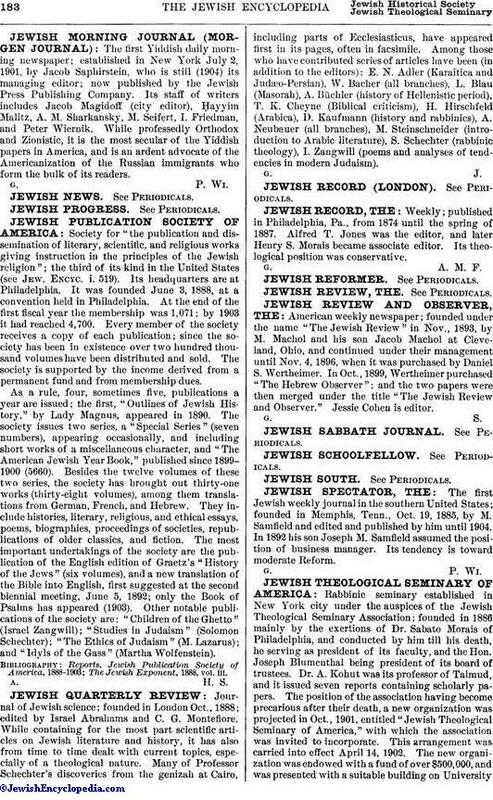 Journal of Jewish science; founded in London Oct., 1888; edited by Israel Abrahams and C. G. Montefiore. While containing for the most part scientific articles on Jewish literature and history, it has also from time to time dealt with current topics, especially of a theological nature. Many of Professor Schechter's discoveries from the genizah at Cairo, including parts of Ecclesiasticus, have appeared first in its pages, often in facsimile. Among those who have contributed series of articles have been (in addition to the editors): E. N. Adler (Karaitica and Judæo-Persian), W. Bacher (all branches), L. Blau (Masorah), A. Büchler (history of Hellenistic period), T. K. Cheyne (Biblical criticism), H. Hirschfeld (Arabica), D. Kaufmann (history and rabbinics), A. Neubauer (all branches), M. Steinschneider (introduction to Arabic literature), S. Schechter (rabbinic theology), I. Zangwill (poems and analyses of tendencies in modern Judaism).